"These spring rolls are a refreshing change from the usual fried variety, and have become a family favorite. They are great as a cool summertime appetizer, and are delicious dipped in one or both of the sauces." 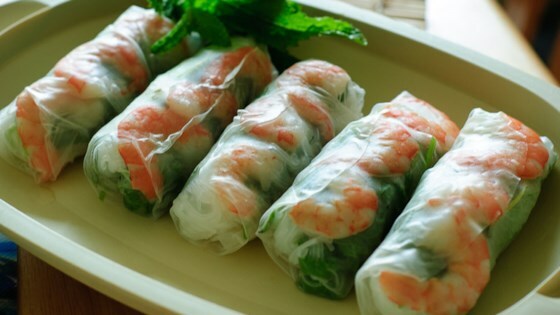 See how to make healthy spring rolls with shrimp. The fish sauce, rice vermicelli, chili garlic sauce, hoisin sauce, and rice wrappers can be found at Asian food markets. These rolls were great the same day I made them. They still tasted good the next day, but they started to get a little sticky. If you are serving them to company, make them fresh.